Standard - €47.99 X-Large - €47.99 Only 8 left! What’s that smell? Ah, friend! That’s the robust aroma of justice in the morning. It’s the sweet, undeniable sensation of doing the right thing and the knowing that the city you protect will feast upon the delicious flavor of peace and harmony today. It’s the smell of evildoers trembling at the thought of your heroic fist administering the appropriate sentence for their evil deeds to restore balance into the world. Spoon! Well there, chum. Do you have the fiery passion for peace living inside of you? Then it’s time for you to exert your awesome might upon the world! It’s time for you to become The Tick! 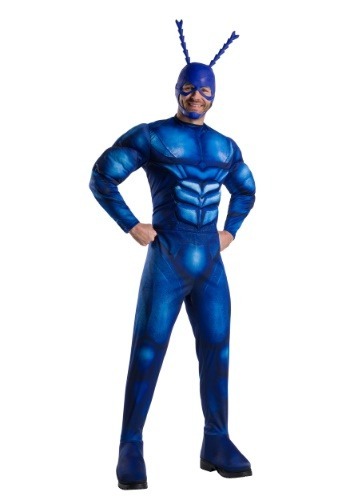 Yes, with this officially licensed costume from the show, you can finally achieve your destiny of becoming a true superhero. This glorious Tick costume comes in an adult size, perfect for transforming into a superhero… sorry, no child sizes. Their small hands just aren’t big enough to serve justice to criminals on a silver platter. The bright blue jumpsuit has muscle padding to help accentuate your already spectacular physique. It even has a six-pack of abs along the front. The legs end in boot covers, so you can wear your favorite pair of lucky shoes while you battle against the forces of evil. Topping it all off is the mask, which has a chin strap, generous openings for your mouth, nose, and eyes. It even has a pair of antennae on the top of it. Destiny’s powerful hand has made the bed of your future, and it’s up to you to lie in it. You’re destined to be a superhero. To right wrongs, and to pound two-fisted justice into the hearts of evildoers everywhere. And you don’t fight destiny. No sir. And, you don’t eat crackers in the bed of your future, or you get all… scratchy.